Please stop by Mr. Downs’ class today for more information. 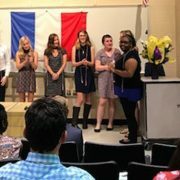 On May 31st, 68 new members were inducted into the Abby Aldrich Rockefeller Chapter of Lafayette High School’s National Honor Society. Beth Yurokvac from Dream Catcher’s Therapeutic Riding Center was the guest speaker. 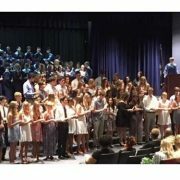 Seniors are pictured in their Graduation robes and NHS stoles, and new inductees are in the front. 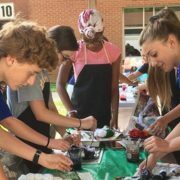 Mrs. Crowley’s chemistry class learned about chemical bonding and pH by tie dying t shirts earlier this week. Look for their tie dye creations Friday! 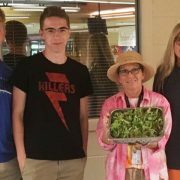 The Lafayette Sustainability Club recently shared their organic lettuce with students during lunches. Are you interested in being a part of Lafayette’s drug and alcohol resistance team? If so, come join us Friday during first block for an LDART informational meeting. Food will be provided! Spots are limited, so sign up on the list next to the upper commons ticket booth as soon as possible! If you have any questions, please see a committee member. 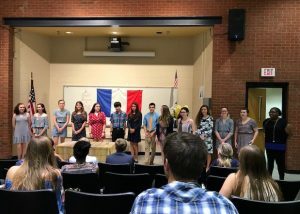 Lafayette High School’s Société Hononaire de Français inducted 12 new members during the Spring induction ceremony. Shown above and are the Seniors in the Senior Send-off with cords and flowers. Pictures 2 & 3 show the induction ceremony. 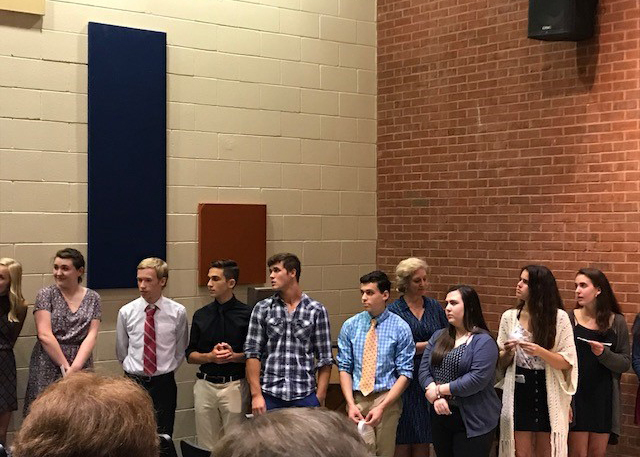 The Grand Concours Test Recipients who received awards and State placement for their test scores are shown in Picture 4. They are (left to right) : Isabel O’Connor top 15% Nation, Alice Leruth 10th Nation, and Atlee Paterno # 1 state. 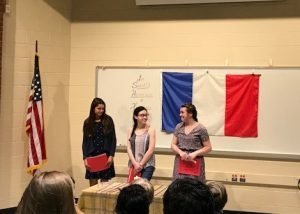 Congratulations to all of Lafayette’s awesome French students! Your library materials are now overdue! This includes books, graphing calculators, flash drives, and charging cables. Please return your items ASAP. See the media center for a list of what you have checked out. Today, during lunch, the sustainability club will be serving samples of lettuce grown in our very own school garden. Offer extended until supplies last! Do you like to run? Are you interested in testing your limits? Then join the Lafayette Cross Country Team! Come to an informational meeting TODAY at 2:30 in the lecture hall. See Mr. Wortman with any questions. 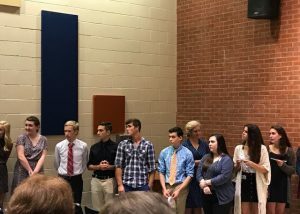 Rising 10th – 12th Grade Students! The Marching Rams are still looking to add new members to its award winning Color Guard. If you enjoy dance and would enjoy the challenge of learning to perform with our Flag Team, then come see what it’s all about. Clinics start Wednesday, June 6th, from 6-8 PM with Mrs. Morris. Sign-ups are on the band room door! Please see Mr. Hargis if you have questions. Your library materials are now overdue! Please return your items ASAP. See the media center for a list of what you have checked out. Yearbooks have arrived! There are a limited number of books remaining; they will be on sale for $80 beginning this morning in room 415, and will be sold on a first come, first serve basis. Athletic Physicals for the 2018-19 school year will be offered at the LHS Clinic TODAY beginning at 4:00 pm for $20.00. If paying by check, make it payable to LABC. If you show up after 5:30pm you WILL NOT BE ABLE TO GET YOUR PHYSICAL, so get there early! You must have a completed VHSL physical form signed by a parent or guardian. Physical forms are available in English and Spanish on the athletic director’s office door. French Honor Society members – our SHF Spring induction will be TONIGHT, at 6pm in the Lecture Hall. Please arrive by 5:30pm with your goodies and be nicely dressed. Remember your Spring Hours are due as well. Please see Madame Collins with questions. The LHS Book Club will have its last meeting tomorrow, Wednesday, during AEP. Please bring your copy of I Hunt Killers with you. Rambassador applicants- the final list is posted by Mrs. Tracy’s room. Our first meeting will be tomorrow during AEP in room 402. Do you like to run? Are you interested in testing your limits? Then join the Lafayette Cross Country Team! Come to an informational meeting this Wednesday, June 6th, at 2:30 in the lecture hall. Please see posters for more information. Interested in playing ladies’ basketball? The 2018-19 season isn’t too far away, and now is the time to prepare! Summer workout sessions will be on Tuesdays and Thursdays from 2:30 – 4pm for all rising 9th thru 12th graders who are interested in playing. For more information, contact Coach Williams. All library materials are due back today! Please return your items ASAP. See the media center for a list of what you have checked out. Yearbooks have Arrived! Preordered books will it be delivered today during 3rd block. There are a limited number of books remaining; they will be on sale for $80 beginning on Tuesday morning in room 415, and will be sold on a first come, first serve basis. The class of 2018 senior VHSL activities banquet will be held tomorrow at 5:30 pm at the Ford’s Colony Pavilion. Athletic Physicals for the 2018-19 school year will be offered at the LHS Clinic TOMORROW beginning at 4:00pm for a cost of $20.00. If paying by check, make it payable to LABC. If you show up after 5:30pm you WILL NOT BE ABLE TO GET YOUR PHYSICAL, so get there early! You must have a completed VHSL physical form signed by a parent or guardian. Physical forms are available in English and Spanish on the athletic director’s office door. 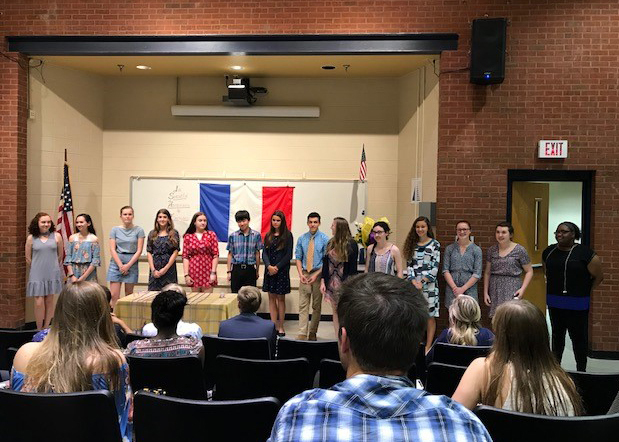 French Honor Society members – our SHF Spring induction will be tomorrow, Tuesday, June 5th, at 6pm in the Lecture Hall. Please arrive by 5:30pm with your goodies and be nicely dressed. Remember your Spring Hours are due as well. Please see Madame Collins with questions. The LHS Book Club will have its last meeting on Wednesday, June 6th during AEP. Please bring your copy of I Hunt Killers with you. Interested in playing ladies’ basketball? The 2018-19 season is not too far away and this is the time to prepare! Summer workout sessions will be on Tuesdays and Thursdays from 2:30 – 4pm for all rising 9th thru 12th graders who are interested in playing. For more information, contact Coach Williams.